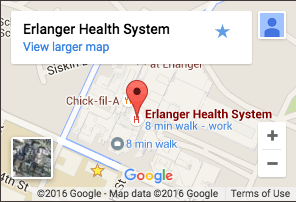 Erlanger is a multi-campus system providing comprehensive services to the residents of four states. Since it opened its doors over a century ago, Erlanger has maintained its reputation in the region as a leader in healing and teaching. Employees and volunteers at all campuses are committed to providing outstanding customer care to patients and their families. Patient satisfaction is of paramount importance to us and we welcome your comments and observations both during your stay and afterwards. Please contact us by phone, letter, or e-mail if you have any suggestions on how we can improve our level of service and/or to single out employees, volunteers, or physicians who have exceeded your expectations.